First off: I’m going to Italy!! It’s a bit short notice, but if any of you is planning to go to Lucca Comics in two weeks, I will be there too! I’ll only be there two days, Thursday Nov. 1 and Friday Nov. 2, but I will be mostly stationary at a booth dedicated primarily to Vincenzo Lunardi (an aviation pioneer born in Lucca) and secondarily to Chicken Wings. I will follow up with details how to find me. It sure would be great to meet some Italian fans! 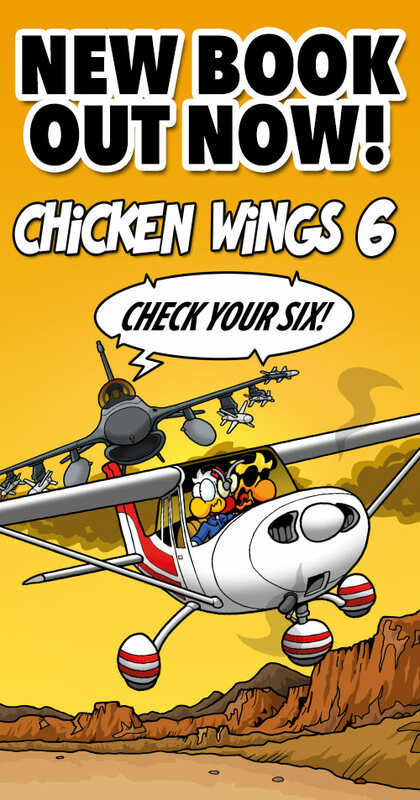 About today’s strip: Chicken Wings themed aviation safety posters are one of the many items on our list of project ideas. Chuck and safety posters is a match made in heaven and it’s a shame we haven’t gotten around to making more than a couple and in any significant quantity … Well, we’ll keep it in the back of our minds!